Christmas Ornaments Made in USA - 2011 Mount Vernon Prayer at Valley Forge Ornament - A Christmas Ornament Co. The 2011 Mount Vernon Prayer at Valley Forge Christmas Ornament. The story of Washington's prayer in the snow at Valley Forge is one of America's most cherished tales of the epic struggle to survive against terrible odds, against hunger, and disease and the unrelenting forces of nature. George Washington's life, his writings, accounts from family and friends prove he was a devout Christian. Moreover, we know that his prayers were impressive. This is stated in the tradition of his discovery by Isaac Potts deeply in prayer on Christmas Day 1777. This story is well documented in the historical records. Isaac Potts, 26 years old, was a resident of Valley Forge, and as a Quaker was opposed to the war. He supervised the grinding of the grain which George Washington ordered the neighboring farmers to bring to his army. The fullest account of Potts' testimony is in the "Diary and Remembrances" of Rev. Nathaniel Randolph Snowden, a Presbyterian minister and a Princeton graduate (Original Manuscript at the Historical Society of Pennsylvania; Call no. PHi.Am.1561-1568). 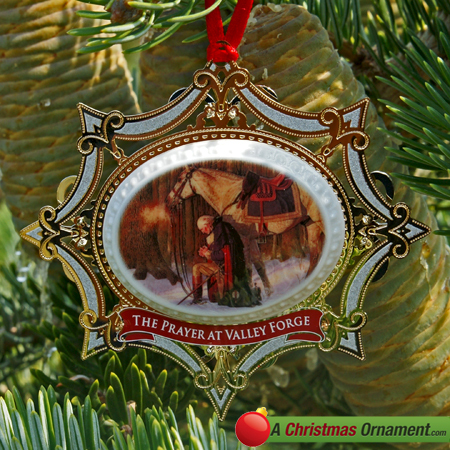 The Prayer at Valley Forge Christmas Ornament is handsomely decorated by a 24-carat, gold-finished brass frame with enameled colors on porcelain. The reverse shimmers with a winter scene of the Mount Vernon Estate.